The value of human capital is greater than just about any other asset an organization can hold, yet with that value comes an often significant level of risk. People are counted upon to provide the leadership, management, and skills necessary to achieve organizational objectives. But what happens when the skills of your workforce fall short? Human capital carries risk that is measured by the difference between the skills that are necessary to achieve the organization’s business goals and the actual abilities of the workforce. We conduct employment screening for a variety of reasons but the overarching rationale is to manage human capital risk. Numerous risks present themselves when the people of an organization are unfit to meet the company’s objectives. These risks are far-reaching and may include employment practice liability, safety concerns, worker productivity, employee absence, employee theft, and catastrophic events affecting employees, customers, and the public at large. Employment screening is intended to help address such risks. Taken from the popular G.I. Joe cartoon series, knowing really is half the battle. Before you can address the human capital risks that face your organization, you’ve got to identify what those risks are. Only then can you determine how you’ll use employment screening to mitigate them. Before we discuss how to evaluate your risks, it’s important to understand the distinction we make between positions and roles within the company. Often organizations focus only on positions and neglect to look at the roles individuals will play. Looking at positions tends to limit our view of the potential risks since it’s primarily focused on what an individual was hired to do, as opposed to what they potentially could do as a result of their role in the organization. For example, the job description of a financial office secretary likely does not include oversight of individual financial accounts but in reality, the secretary does have access to sensitive customer information so realistically, the role of the secretary may present similar risks as the financial planner whose job description specifically requires handling and management of customer financial information. 1. 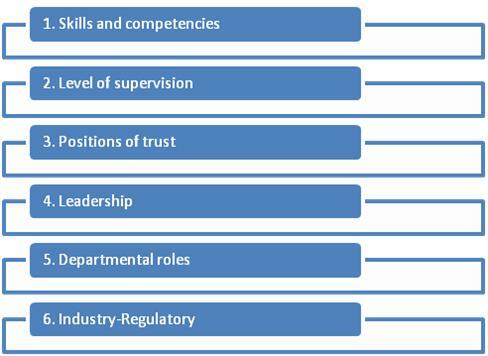 Skills and competencies of the individuals in a particular role. In general, the less skilled and competent the worker, the greater the risk. Certain roles within the organization can be filled by people with a lower level skill and competency. The benefit to the organization is that these lower-skill jobs can be staffed with less expensive labor. The downside is that risks go up with a lesser-skilled workforce. These risks, which may include lower productivity, higher rate of absence, and higher turnover, can be mitigated with a screening program that helps employers better predict how an individual will perform in the role. With higher risk comes a greater need for screening. 2. 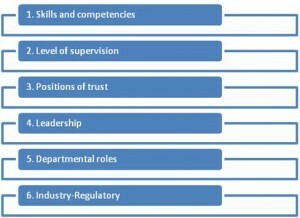 Level of supervision provided to the individuals in a particular role. Supervision is a key component of assessing employee/human capital risk. An individual with access to people or property under close supervision is clearly less of a risk to the organization than an individual who has unsupervised access to people or property. As you’re evaluating the risk of a particular role, be sure to consider how much supervision an individual will have in that role. As the supervision decreases, the risk rises. 3. Level of trust inherent in the position. A so called, “position of trust” is one in which an individual is entrusted with the care or supervision of sensitive populations (such as children or indigent populations), information (financial or otherwise), or property (i.e. pharmaceuticals, cash, etc.). Clearly, the greater the level of trust, the greater the potential risk. A screening program must be designed to minimize the chances of hiring the wrong person for any position of trust. 4. Leadership roles. The greatest risks (and rewards) to an organization, from a human capital standpoint, generally lie with its leaders. Company leaders direct the accomplishment of the organization’s objectives and their profile is such that a bad hire can dramatically affect the culture, success, and image of the company. The risks of hiring the wrong person and the rewards of hiring right make employment screening for leadership positions a critical activity. 5. Departmental factors that affect risk. Certain departments naturally bring more risk to an organization. Finance departments, for example, offer clear risks that need to be addressed with an employment screening policy. Departments responsible for direct customer contact, such as in-home installations, bring equally significant risk. When screening an individual, be sure to consider the department in which the individual will work and establish your policy to address the inherent risks. 6. Industry-specific risk and/or compliance requirements. Like departmental risk, certain industries carry greater risk than others and some companies face compliance requirements set by contractual or>regulatory requirements Transportation, banking, education, healthcare, and retail all have specific industry-related risks – as do many others. Pharmaceutical couriers, companies with federal contracts, and others face compliance requirements, either legislative or contractual, that increase the need for employment screening. Taking a look at each of these factors in detail will give you an indication of the relative risk for the various roles people will play in the organization. With a clear evaluation of the risks, it then becomes possible to approach the second half of the battle – addressing the risks. 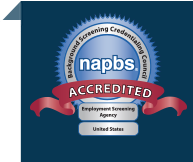 In the meantime, to discuss your employment risks or to build a better background screening program, request a meeting with our background screening experts.